After 4 months of floor replacements, ceiling replacements and a new wall in my Daughter's room, I can finally get serious with my UFOs. I finished the 5 BOM for Sew Spooky and was anxiously awaiting the finishing kit, month 6. Well month 6 is a misnomer! I hand embroidered the original 5 blocks and made the 2 additional blocks and added the sashing for the center section. 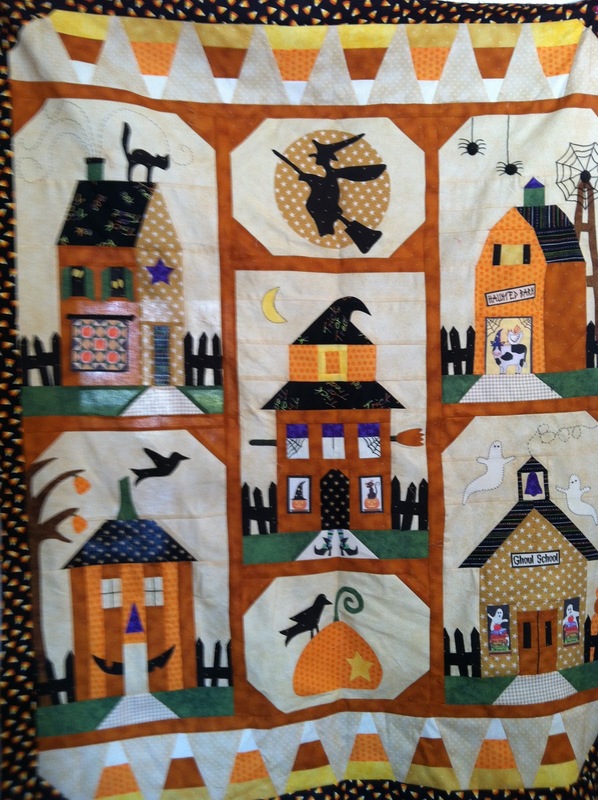 I then pieced the candy corn borders and added the second border. I now need to applique 14 bats with 28 eyes onto sections for the next border. To set these borders I will need to make 4 appliqued corner squares. After this is together, then comes the stars to be appliqued onto the borders! I decided that my new fmily room needed a new quilt. I made up the 1600 inch Jelly Roll from YouTube by the Missouri Quilt Co. http://www.youtube.com/watch?v=2bEJLnaZQOU I added a border and it is waiting to be quilted. Not to want to miss anyting new, I decided to take a tuffet class at the Round Bobbin in Horsham, PA, and have 6 of 8 wedges completed. I should have the Sew Spooky top completed and ready for quillting by next week. Yesterday I finished 3 of the Sew Spooky blocks. 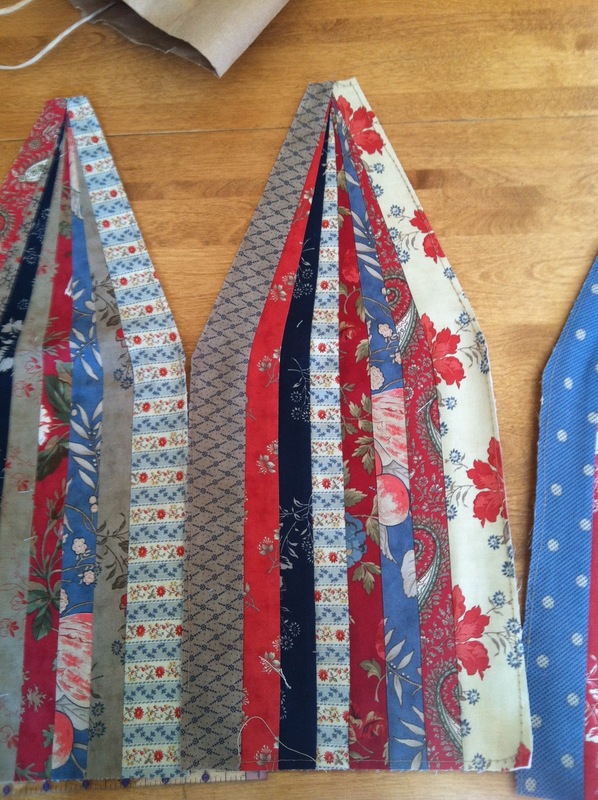 These blocks have lots of pieces to cut as well as the appliqués. I found that it is much easier to make sure all my pieces are labeled. I used the small stickers that you can buy at any office supply, Walmart or Target. I put the pice letter as well as the number of identical pieces on the labels and pinned together when I needed 2 or more cut. I keep the pieces in order and use a plastic bag to store them if I get interrupted while sewing. Since I was on a roll, I figured that I should get one Hanukah apron done. I will have our annual latke fry on Sunday. I know I need one of those organizer persons for big time help! No matter how much I try to get my studio organized, I just have more fabric than space. I am organized challenged! If anyone is good at this and has a little time on their hands, p,ease let me know if you live near Philly! Wow! A 48 x 64 quilt top in about an hour! 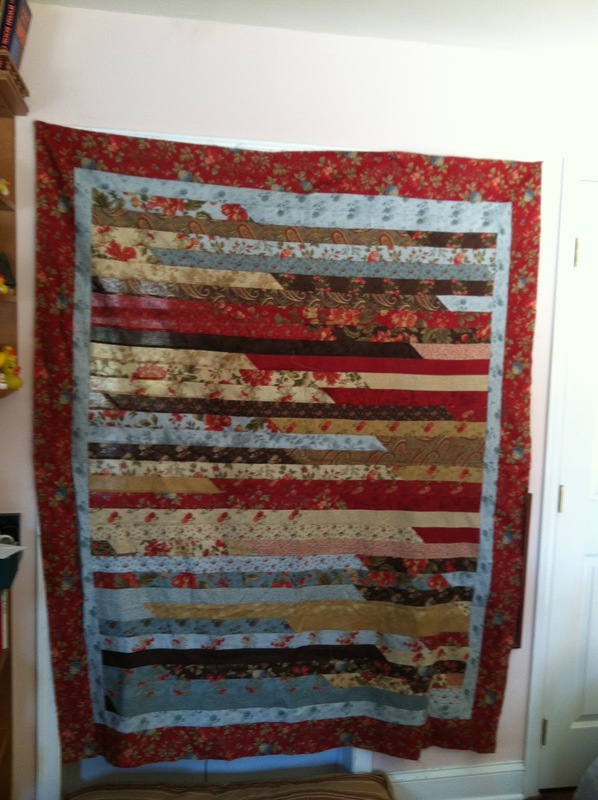 I am hoping to get a long armed to quilt it and we will donate it to the local hospital's breast cancer unit. I also finished block two of Sew Spooky. I plan on cutting Bock three today. I will now be only 2 blocks behind schedule. How do those guild ladies get so much done month after month? Hope your quilting is pucker less! Maybe it was really a bit of good fortune that The BIG storm Sandy came to town. To prepare, I had to actually clean my studio. I knew from past experience, that we will not mention, that there was a good chance that water would run through the doors and wet anything even close to the floors. SO I took every project and made sure it was in a nice plastic project box and brought the projects, four sewing machines and a serger into my house. I actually purged my scrap stash. It was at that moment, I knew that I had to vow not to buy or start another new project until I completed at least 4 UFOs. Then I would finish a UFO for every new prject I started. Great plan. At that rate, I could actually have a reasonably neat and organized space by 2020! I knew this was doable. The came the storm. No power for 7 long days. Once upon a lifetime, 5 kids ago, I would have thought bathing by candle light was romantic. NO!! Neither is soup and pasta by candle light when it is cold. Also we lost my 98 year old Mother-in-law in the middle of the storm. So all work was put on hold. Well today was the day to start on catching up. I am two months behind on my BOM just to start! BUt today I was meeting up with Cheryl Lynch, who published SEW Embellished! She also writes Wednesday Wandering blog.http://cheryllynchquilts.blogspot.com/2012/11/new-friendnew-shop.html I met her at The Round Bobbin, a fabulous quilting shop in Ambler, PA which is near my home. I made a wonderful friend who introduced me to this gorgeous shop. If you visist Philly, be sure to visist the Round Bobbin just off the PA Turnpike. Great vow of not buying anything new flew right out the windo! Bought a couple of fat quarters, a new pattern and a 1/4 yard for it and two books and the cutest little Moda Candies, 2 1/2 inch squares. So much for not buying anything new! Well as my childhood heroine said, "Tomorrow is another day!" I promise to work on those Blocks!